British Airways cabin crew have "overwhelmingly rejected an offer" aimed at ending a long-running row over pay and conditions, Unite has said. The union said, with turnout of 71%, thousands had voted and there had been an 81% majority against the proposals offered by the airline. Unite had "strongly recommended" its members reject the offer, raising the possibility of more strikes. British Airway said the offer had been "very fair" and it was disappointed. 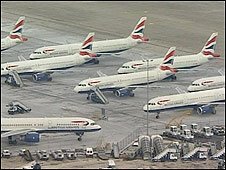 In a statement, BA said it was "not too late for Unite to put an end to this dispute. "British Airways is disappointed but not surprised that Unite has clearly orchestrated a rejection of a very fair offer that addresses all the concerns raised during 14 months of talks. "We urge Unite to put an end to this unnecessary dispute and focus on the best interests of its members. There can be nothing positive to be gained from further strikes." Cabin crew strikes in March led to widespread disruption for passengers, which the airline said cost it £45m. Further disruption to flights caused by ash from the Icelandic volcano in April cost it an additional £180m. Unite will have to give a week's notice of any new planned strikes. Cabin crew face no pay cut or reduction in terms and conditions - and remain the best rewarded in the UK airline industry." Cabin crew representatives are set to meet Derek Simpson and Tony Woodley, Unite's joint general secretaries, to plan their next move. The two men said: "BA management should take note of their own employees' strong rejection of their offer and immediately address the outstanding concerns. "They should make no mistake that Unite is fully committed to supporting our members in furthering this dispute if no resolution is found." British Airways defended the offer and said: "The majority of our crew came to work during the previous strikes and demonstrated their firm commitment to our customers, despite their union's callous disregard for the travelling public. "Unlike other businesses and airlines, we have avoided compulsory redundancies. Cabin crew face no pay cut or reduction in terms and conditions - and remain the best rewarded in the UK airline industry." But in a letter to cabin crew, before the results were announced, Mr Woodley said that BA was treating staff like second-class citizens who had been "branded" for going on strike. He said the union was urging rejection of the new offer because BA had failed to restore travel perks taken away from those who went on strike and disciplinary action was being taken against more than 50 union members. The ballot result comes a day after Duncan Holley, a leading union official at BA, claimed he was sacked for gross misconduct for taking time off work before Christmas to carry out union duties. The Unite branch secretary said his dismissal after 12 years was "politically motivated". BA said it would not comment on individual disciplinary cases. Is right to strike under threat? Q&A: What's the BA dispute about?